The Washington, D.C. primary is on Tuesday. Sanders will be holding a rally Thursday night at 7 p.m. at the D.C. Armory. For upcoming events, see accuracy.org/calendar. Hagler is senior pastor at the Plymouth Congregational United Church of Christ in Washington, D.C. and chairperson of Faith Strategies, which recently released a letter signed by a number of noted activists, clergy people, union officials and others in D.C.: “Bernie Sanders, with both his record of leadership over the years and his platform, has spoken out against injustice in ways that are virtually unprecedented in the history of U.S elections. His grassroots support that has almost completely funded his campaign is speaking loud and clear that we want meaningful change and we need to give a voice to those who are often voiceless. Jenkins is with the Stand Up! for Democracy in D.C. Coalition (Free D.C.). She said today: “We advocate for D.C. Statehood and an end to the federal government having power over local policy rather than the people of the city having such authority. It’s a ridiculous situation: 600,000 people have no voting representation in Congress or real autonomy. “Hillary Clinton recently wrote a piece for the Washington Informer pledging that she’ll ‘be a vocal champion for D.C. statehood.’ Sanders voted for D.C. statehood when he was in the House. 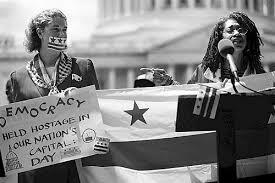 D.C. Statehood was in the Democratic Party platform, but was taken out over a decade ago. The new platform committee just heard testimony on Wednesday about D.C. statehood. But this process has taken so long — and we’ve learned you can’t take politician’s statements at face value. President Obama told me personally in 2008 that he wanted statehood for D.C. Of course, nothing happened, even when there was a Democratic majority in both houses of the Congress. “Two states — Vermont and Wyoming — have smaller populations. About ten more have populations that are comparable. “The fact that we’ve not been able to determine our own policies has done real damage to the people of the city. There’s some attention paid to Congress running roughshod over the public’s attempts to have gun control or medical marijuana, but that’s just the tip of the iceberg. “We don’t get to appoint or elect our own judges — that’s done through Congress. Congressmen have even threatened to arrest city officials for not being sufficiently servile. We don’t have budget autonomy. These types of things make the people less powerful and monied interests more powerful, so D.C. has been gentrified in recent years at an unprecedented rate. Meanwhile, people in D.C. still pay the highest federal taxes per person in the country.